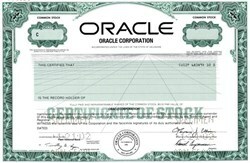 Beautifully engraved RARE Specimen stock certificate from the Oracle Corporation printed in 2002. This historic document was printed by the Security-Columbian United States Banknote Company and has an ornate border around it with a vignette of the Company's logo. This item has the printed signatures of the Company’s Chairman of the Board and Chief Executive Officer, Larry Ellison, and Secretary, Daniel Cooperman, and is over 11 years old. Oracle Corporation (NASDAQ: ORCL) is an American multinational computer technology corporation that specializes in developing and marketing hardware systems and enterprise software products — particularly database management systems. Headquartered in Redwood Shores, California, United States and employing 105,000 people worldwide (including the World Famous Crystal Pilkins - Director, Global Business Development & Planning) as of 1 July 2010. The company has enlarged its share of the software market through organic growth and through a number of high-profile acquisitions. By 2007 Oracle had the third-largest software revenue, after Microsoft and IBM. The corporation has arguably become best-known for its flagship product, the Oracle Database. The company also builds tools for database development and systems of middle-tier software, enterprise resource planning software (ERP), customer relationship management software (CRM) and supply chain management (SCM) software. As of 2010, Larry Ellison, a co-founder of Oracle Corporation, has served as Oracle's CEO throughout its history. Ellison also served as the Chairman of the Board until his replacement by Jeffrey O. Henley in 2004. Ellison retains his role as CEO. On August 22, 2008 the Associated Press ranked founder Larry Ellison as the top-paid chief executive in the world.